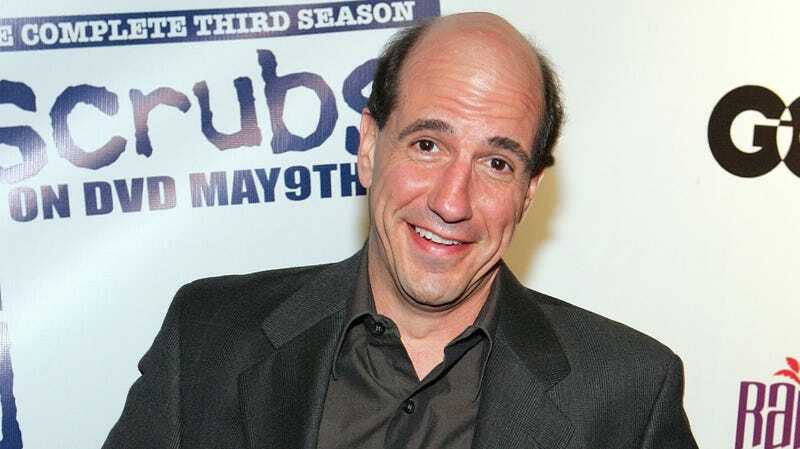 As reported by TV Guide, actor and musician Sam Lloyd—best known for playing sad, sweat-soaked lawyer Ted Buckland on Scrubs—has been diagnosed with cancer. A GoFundMe page set up by Scrubs producer Tim Hobert and his wife Jill Tracy says that Lloyd began to suffer from prolonged headaches at the beginning of this year, which he initially attributed to exhaustion from caring for both his newborn son and his elderly mother. As his headaches got worse, he went to a doctor and got a CT scan that revealed a mass in his brain. An attempt to remove the tumor then revealed that cancer had come from his lungs and had spread to his liver, spine, and jaw as well. The campaign is looking to raise $100,000 and—as of this writing—has raised just under half of that. Scrubs creator Bill Lawrence and star Zach Braff have shared links to the campaign, pledging their support and offering hopes for Lloyd’s recovery.